So the other day I was going to heat up some Uncle Ben’s 90-second rice (AKA “rice for people who don’t plan ahead”) to go with some frozen coconut shrimp from Trader Joe’s (AKA “dinner for people who don’t plan ahead”). This place does not exist! 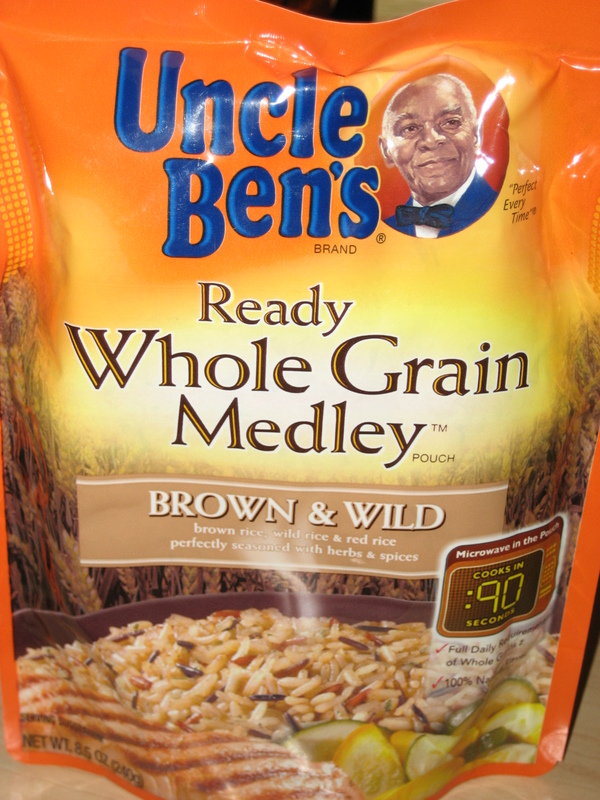 Who did not proofread your label, Uncle Ben? O Uncle Ben, your spelling is sloppy! i once met a canandese fellow while i was over seas. it was years ago. he was full of national pride, and in his thick and magical accent, he told me tails of his nations. once every 25 years cananda wakes up and visitors to its remote and fabled locale are able to see its splendor. they are a private people. apparently they appear every 25 years with the single purpose of peddling their very safe and very convenient grains. i haven’t thought of him in years until seeing your post just now. thank you for waking up this very precious memory…. i suddenly have a craving for their national dish: orchid and rice mash with boysenberry thyme dressing. Jim says: Mmmmm! Can I get that in a 90-second pouch too? May I point out two additional facts o’ interest? Fact #1: The ‘premium rice grains’ were grown in the USuvA. Which leaves me wondering what, precisely, was made in Cananda. Perhaps Cananda is a second label for the USuvA. Or perhaps, the rice was grown in the USuvA, shipped to Cananda, wherever it is, to be put in a bag so it could be shipped back to the USuvA. Which is both probable and mind-bogglingly inefficient. Did your rice cost about $30? Fact #2: Nothing ‘wild’ comes in a plastic bag with a little picture of a microwave on it. Jim says: This is a good point! American rice-bagging workers are probably losing their jobs because of this sort of thing. We clearly need some sort of legislation to prevent the re-importation of bagged food from Cananda, or from outer space. Hmmm. Even Yahoo Travel Has Heard of Cananada. Cananda is where the goonooses wininter. Hononk! Hononk! I buy that all the time (because it is for people who like to cook easy stuff) and I never noticed it was from Cananda. 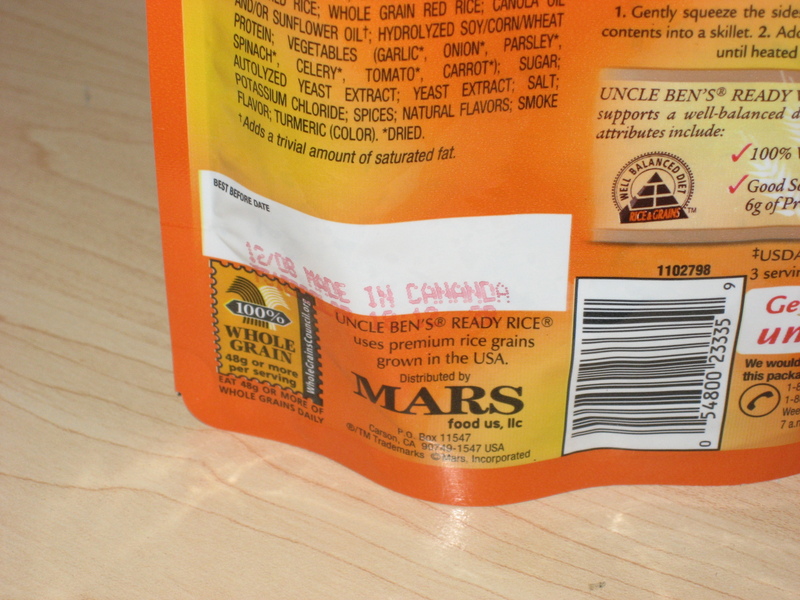 I just went and looked on my Cajun Style Uncle Ben’s rice and it had a “use by” date and numbers where your Cananda was. What’s worse, Made in Cananda or no info about where it is from? I’ll take Cananda. Jim says: Hello and welcome! While you’re in Cananda, make sure to try some of their orchid and rice mash with boysenberry thyme dressing. Goodbear tells me it’s fantastic. I hanven’t thne slighntest indea wheren Cananda isn. as a Canadian, I am used to the entire world knowing nothing about my country, but I thought at least they could spell it’s name! C eh N eh D eh… not that hard! Jim says: Oh dear, I hope you aren’t referring to Cananda’s arch-nemesis Brigadoon! brigadoon shmigadoon. it takes those turkeys 100 years to roll around. cananda is much better.